Arctic sea-ice extent varies considerably from year-to-year, especially in the summer. Skillful forecasts of the expected extent could be valuable to a wide range of Arctic stakeholders. But, how predictable is the Arctic sea-ice extent in summer? And, can more complex sea-ice models with improved representations of key physical processes improve forecasts? Relative to the 1979-2000 baseline, September 2012 showed a reduction of Arctic sea ice extent (SIE) of 49%, and a reduction of sea ice volume of 72% (PIOMAS estimate confirmed by CryoSat2 observations, Overland & Wang 2013 and Laxon et al. 2013). Probably due to a weakening of the ice, these trends have been accompanied by an increase of the average sea ice drift of 9(±1.9)% per decade and average deformation of 50(±10)% per decade (Rampal et al. 2011). The World Climate Research Programme CMIP5 climate modelling study reveals that the spread of Arctic September sea ice between the individual members is considerable. The September mean SIE (x axis in Fig. 1) over the satellite era (1979-2010) varies between 2 and 12 million km2 while the SIE trend over the same time period (y axis in Fig. 1) ranges from 0 to -1400 km2/10years (Massonnet et al. 2012). Figure 1: 1979–2010 mean of (x-axis) and trend in (y-axis) September Arctic sea ice extent, as simulated by the CMIP5 models and their members. Members of a same model (if any) are represented by dots (•). Individual models (or the mean of all their members, if any) are represented by crosses (×). Figure from Massonnet et al. (2012). This situation calls for a re-evaluation of the physical processes involving sea ice in these models. Over the last decade the Centre for Polar Observation and Modeling (CPOM) has used a bottom-up approach: including new physics in a stand alone (uncoupled) version of the Los Alamos CICE sea ice model, which in turn can be used in ocean-sea ice coupled models (FAMOS initiative) and fully coupled climate models (Met Office, Rae et al. 2014 and Keen et al. 2013). We believe that this methodology can contribute to significantly reduce the model response uncertainty in the next round of GCM results, CMIP6. In a study recently published in Nature Climate Change (Schroeder et al. 2014) we showed that by implementing this novel physics of sea ice we can produce the first skillful statistical prediction of September Arctic ice extent. We have implemented two new processes into CICE: a prognostic model for melt-ponds and an elastic anisotropic-plastic (EAP) model that explicitly accounts for the observed sub-continuum anisotropy of the sea-ice cover (Tsamados et al. 2013). The principal concept of our melt-pond model is that the melt water, formed as a result of snow, ice melt and precipitation, runs downhill under the influence of gravity and collects on sea ice starting at the lowest surface height (Flocco et al. 2012). Applying the melt-pond model and the EAP model, we performed a stand-alone sea-ice simulation for the pan-Arctic region (40 km grid resolution) over the period 1979 to September 2013. We find that the Arctic sea-ice minimum can be accurately forecasted from melt-pond area in spring with a strong correlation between the spring pond fraction and September sea-ice extent. Fig. 2a shows that years with maximum (minimum) sea ice coverage, for example 1996 (2012), correspond to minimum (maximum) pond coverage. This is explained by a positive feedback mechanism: more ponds reduce the albedo; a lower albedo causes more melting; more melting increases pond fraction. Hence our model calculations, by showing that the increase of melt-ponds (4%/decade in July, Fig. 2b) results in the observed decrease in summer albedo (3%/decade in July/August), help explain the acceleration of Arctic sea-ice decrease during the past decades. Figure 2: Temporal variability of Arctic melt-pond area. a, Annual cycle of Arctic mean fraction of sea-ice area covered by exposed melt-ponds in our CICE simulation. The grey-shaded area shows the range of pond fraction simulated over the 35-year period. b, Time series of normalized pond fraction (mean over the period from 25 June to 25 July). Figure from Schroeder et al. (2014). Our paper demonstrates that inclusion of melt ponds in the sea ice model provides an unprecedented level of skill in predicting observed SIE (Fig. 3). For a forecast based on the integrated pond coverage until the 25th of June the skill value is S=0.41 (S=0 for a simple constant trend projection and S=1 for a perfect forecast) and the error is 0.44 million km2 (mean September ice extent over the satellite era ~6 million km2). For September 2013 we forecast a mean ice extent of 5.55±0.44 million km2, which is closer to the observed mean value of 5.35 million km2 than any of the 23 statistical, model and heuristic predictions presented at the Arctic Sea Ice Outlook webpage in July (median value of 4.0 million km2). 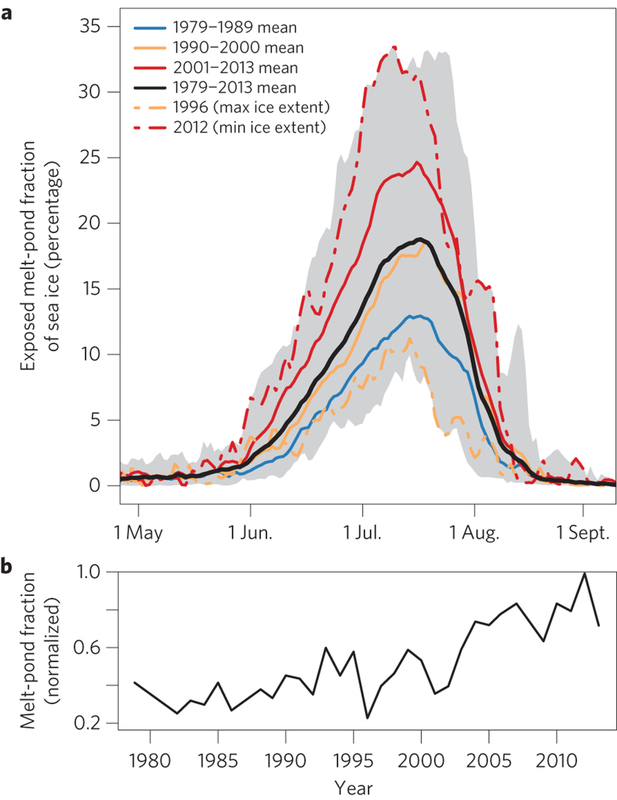 – It is fundamentally impossible to perfectly predict the September ice extent from the spring pond fraction because the impact of the atmospheric and oceanic conditions in July, August and September are not accounted for (e.g. wind effects). – We do not think that a statistical approach is ideal to achieve a regional or local forecast. There are forecast systems based on atmosphere-ice-ocean models and including our melt-pond model into those models could provide valuable regional information. – On seasonal to decadal timescales the predictive skills of models are inherently limited by model response uncertainty and scenario uncertainty, as well as internal variability (see for example the APPOSITE project). – Antarctic sea ice predictions present different challenges and melt ponds are expected to be a less dominant factor in forecasting the sea-ice extent. We conclude that the inclusion of a more realistic sea-ice physics will transform future forecast and climate models in the Arctic regions and beyond. Figure 3: Verification of predicted September sea-ice extent. Predicted ice extent (anomaly from the trend line in a and b and absolute values in c) is verified by use of SSM/I data for the period 1979–2013. Hindcasts (a) and forecasts (b) are based on three dierent integration periods for pond fraction: 1 May–31 May (pond31), 1 May–25 June (pond56) and 1 May–25 July (pond86) and one for fraction of thin ice: 1 May–25 June (ice56). ferr and perr are the prediction and the forecast error in million km2. The given skill values S are with respect to the variance of the de-trended climatology. Figure from Schroeder et al. (2014). Overland & Wang, “When will the summer arctic be nearly sea ice free?,” Geophys. Res. Lett., 2013. Keen et al., “A case study of a modelled episode of low Arctic sea ice,” , Climate Dynamics, 41, 1229-1244, 2013. Tsamados et al., “Impact of a new anisotropic rheology on simulations of Arctic sea ice,” J. Geophys. Res. Oceans, 2013. 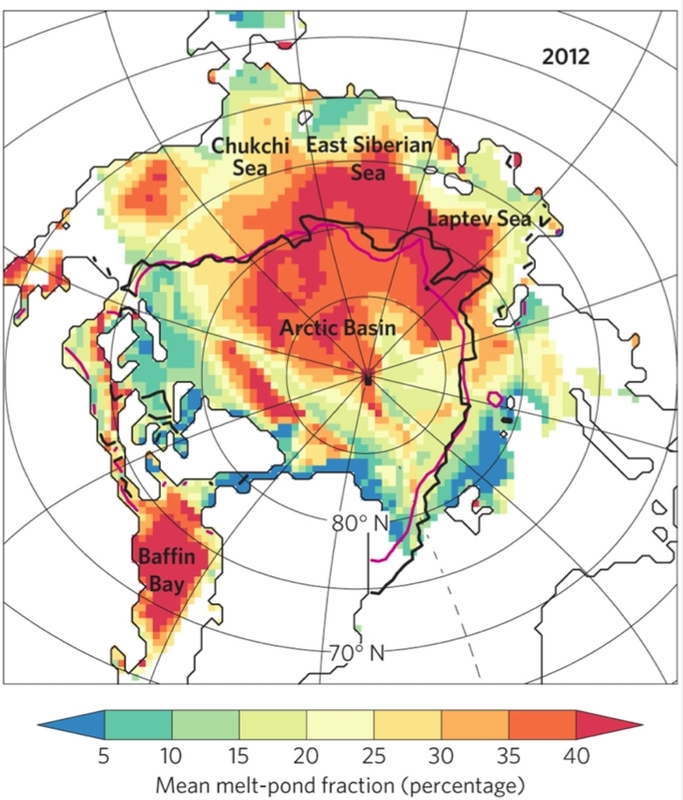 Flocco et al., “Impact of melt ponds on arctic sea ice simulations from 1990 to 2007,” J. Geophys. Res., 117, C09032, 2012. Pingback: What can we expect for this year’s Arctic sea ice? | Climate Etc.